An increased level of persuasion in sales conversations is something every sales professional could use. My guest on this episode of #SellingWithSocial says the only way you can effectively be more persuasive is by having the RIGHT kind of influence with buyers. Who IS my guest? After a military career working with Special Forces teams, where he developed some amazing leadership skills, Rod Hairston spent several years as a salesperson for Tony Robbins. He was part of the team that was selling Tony’s early events to organizations and communities before Tony even had a reputation at all. He went on to become a Tony Robbins Master Trainer. Today, Rod is doing some amazing training with sales, leadership, and organizational development professionals. The conversation you’ll hear on this episode is the first half of the topic, “12 Steps To Persuasion.” Watch for the next installment in weeks to come. 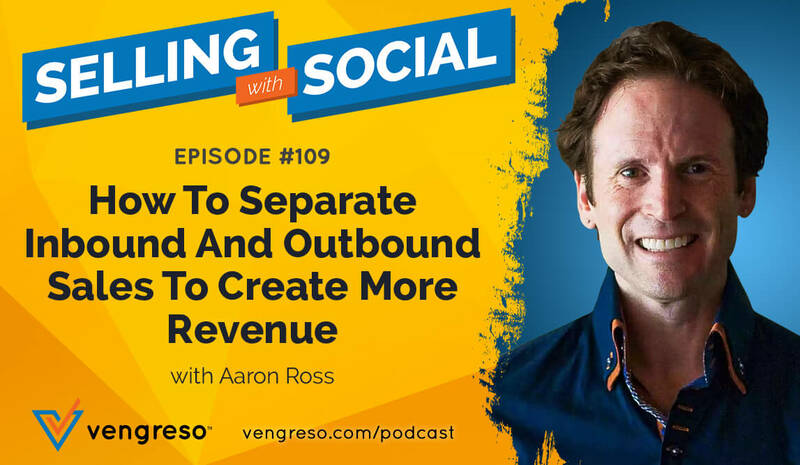 For now, you can listen to this episode and learn how you can build your ability to provide incredible value, generate influence, ask the right kind of questions, and develop skills of persuasion that get more sales. Join Vengreso at STAR, February 11-13, 2019 to mix and mingle with forward thinking sales executives and thought leaders. We’re extending a $250 savings to all Vengreso subscribers. For full details visit: frost.com/vengreso and use discount code MARIO at registration. How many times have you endured a sales presentation where the salesperson seemed nervous, uncertain, and was not at all persuasive? If you’re like me, that’s probably happened more times than you can count. What’s wrong in those situations is that the salesperson is missing a vital mental skill that every successful salesperson must have: Belief. 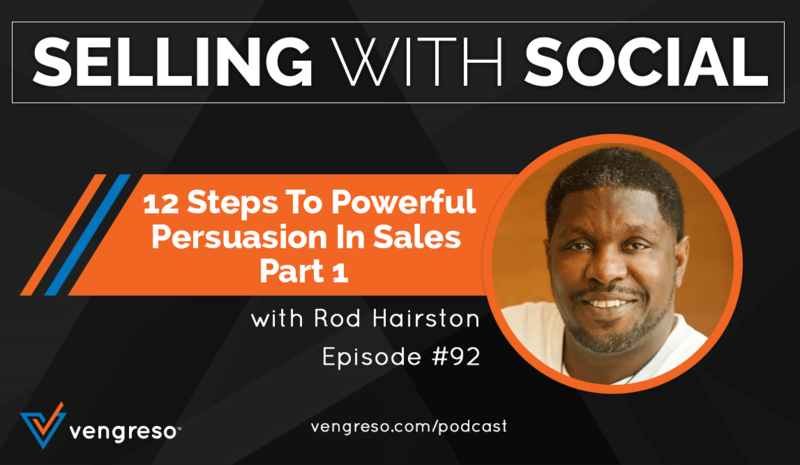 In our conversation, first thing Rod pointed out about having influence in a sales conversations is that without a powerful sense of belief in yourself and your product or service, you won’t get anywhere. Amazingly, it’s a lesson he learned years ago from his 7-year-old son. Rod shares the story in this episode – and trust me – you won’t want to miss it. The mindset and approach to success Rod’s son had at that early age is astounding… and it illustrates perfectly why belief is so powerful and important when it comes to accomplishing anything in sales. Rapport consists of three things: liking, trusting, and respecting. Naturally, we all want our buyers to feel those things toward us – it’s what enables them to feel comfortable enough to buy from us. But Rod points out that rapport is an area where you have to give in order to get. Listen to hear him describe how you can enter every sales conversation genuinely liking your buyers, how you can communicate that you trust them, and how to treat them with the respect that in turn, gets them to feel the same way about you. Don’t miss it. As sales professionals, we know that we must provide value to our buyers. It’s a powerful way to demonstrate expertise, ability, and care. But we won’t be able to provide value that matters to particular buyers if we don’t know what is valuable to them, in their situation. How can you know what they value? Rod says you have to let questions lead the way. As we spoke, Rod explained how certain types of questions open the door to deeper responses than others, and how you can use questions to guide a conversation and keep it focused. He also points out that using the right questions in the right way enables you to have a greater degree of persuasion than you would by “telling” buyers what they need. Rod has a keen insight into the nuances of persuading buyers through asking the right questions, so make sure you listen. When you are communicating with people, their mind is in one of three areas: memory, imagination, or present focus. Rod says that if you want buyers to be focused on what you are saying, you MUST engage their imagination. The best way to do that is through the wise use of stories. When you use stories well, your buyer becomes focused on picking out the point you’re illustrating with your story, which is far more effective than bluntly telling them the point yourself. Engaging their imagination gets them involved in discovering how the solutions you’re presenting fit their situation, which makes persuasion in sales a much easier thing for you to accomplish. Do you see how stories, examples, and illustrations matter? You should always have two or three stories available that are specifically relevant to each prospect. You want to be able to pull them out at any time you see you are losing focus and energy in a sales conversation. Listen to learn how to use customer success stories, case studies, and more to have a hopper full of stories you can use in to add a more powerful bit of persuasion to your sales presentations. Don’t miss Rod’s incredible insights on this episode.